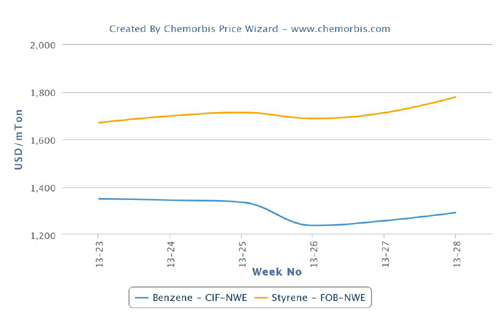 According to ChemOrbis, European PE players had voiced their expectations for rollovers to slight drops of €10/ton for new July ethylene contracts which settled with a rollover from June at €1105/ton ($1238/ton) FD NWE on Thursday. Even before this development, a stable to firm sentiment was observed as sellers were expected to try for renewed price hikes even if monomer contracts softened for the new month relying on supply tightness across the region. 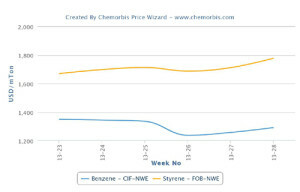 Overall price ranges for LDPE, LLDPE and HDPE were reported stable week over week, prior to the new monomer contracts. June transactions were mostly wrapped up with €60-70/ton hikes on the month after larger increases were sought by sellers earlier in the month as per ChemOrbis pricing service. The main trigger behind the ongoing firm trend has been persistently tight supplies across Europe. In Italy, some buyers reported very tight availability particularly for middle density polyethylene (MDPE) and MLLDPE. Emerging import PE prices from the Middle East throughout June supported reports about ongoing supply issues in the region. On the other hand, there are a few plants reportedly resuming production these days. According to market sources, Versalis started the restart process at its PE plants in Brindisi after a scheduled maintenance. In addition to the company’s two swing plants with 180,000 tons/year capacity each, their 440,000 tons/year cracker will also resume operations in end June. Sabic is reportedly restarting their LLDPE plant in Gelsenkirchen, Germany by end this week following a three week turnaround. The swing plant has a capacity of 175,000 tons/year, market sources reported.